Established in March 2004 by founder members Richard Palmer, Linda Palmer and Russell Rainger, The English Toastmasters Association is now the fastest growing Association for professional toastmasters in the UK, currently with over 50 members. 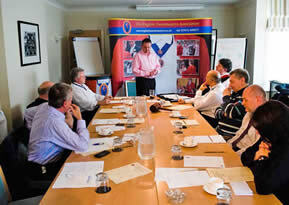 Using a modern and unique style of teaching, The English Toastmasters Association aim to bring a higher standard of training to the profession and meet the needs of individual toastmasters according to their existing experience and future aims. We believe that once a toastmaster has been trained they will be eager to continue to improve and offer their clients the best service possible. As an Association we continue to look at every aspect of our work, taking the time to refine and develop new methods of delivering the finest quality service to and for our member, which in turn helps them to deliver a higher quality service to their clients. Richard Palmer is the only Toastmaster in the world to be certified as working to the ISO 9001:2008 standard, the world class quality standard. Richard's duties for the English Toastmasters association include the training of new and continual training of established toastmasters. Would you like to join an elite group of professionals driven to go above and beyond for their clients and committed to setting the standards within their profession? The courses that we offer at The English Toastmasters Association are designed to cover the basics of becoming a toastmaster and also to cover the most important subjects to help you offer an impeccable service to your clients. We will give you all the help and support to find business and offer outstanding service. You will gain the maximum knowledge to get you started with the confidence and ongoing support of the association and regular help, updates, as well as the opportunity to attend regular meetings and training seminars to continually improve your existing knowledge and liaise with fellow member toastmasters and select wedding professionals. Our courses are run on a one to one basis ensuring you receive a personal service and to take into consideration your existing experience and expertise. Courses for Toastmasters and Master of Ceremonies are run by Richard Palmer from the English Toastmasters Association®. Our basic courses are for three days, which may be consecutive or broken into individual days to suit you. Other people who are involved in the wedding and hospitality business assist with the courses and offer other angles and perspectives for you. We are also pleased to offer realignment courses for experienced toastmasters who wish to join the English Toastmasters Association. A tailored one to one unique training experience, offering you the highest standard of service. We offer training courses tailored to your specific requirements, skills and future aims at our own toastmasters training school at our headquarters in Danbury, Essex, UK. At The English Toastmasters Association we offer a long term commitment to our members, that we will provide ongoing support to help your professional development as a toastmaster. Once your one to one training is complete you are far from being 'on your own'. We are an association dedicated to our members and will regularly monitor your progress and performance and will be there to offer a helping hand as and when you need it. With the opportunity to attend regular training seminars targeting specific subjects, you will be able to liaise with fellow professionals and continually improve and learn amongst other members and professionals all with the same aim - the highest level of client service. 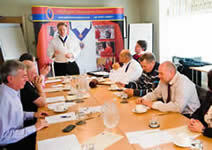 Our toastmasters have the wealth of knowledge and expertise required to offer clients the highest standard of service. Toastmasters that join The English Toastmasters Association are joining an exceptional group of highly trained professionals, setting the standards within the profession and encouraging a greater demand for our services. Why become a member of The English Toastmasters Association? The English Toastmasters Association offers toastmaster training courses for those who wish to learn the skills required to become a professionally trained and client focused toastmaster. With access to the best kept secrets of how you can achieve sensational results when working for your clients, you will be given the best possible start to your new career. To uphold higher standards of training and focus on individuals' existing strengths, our courses for toastmasters are held on a one-to-one basis. 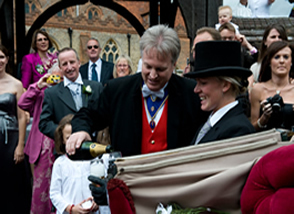 If you are looking to become a Toastmaster that specialises in a particular type of event, for example weddings, we will be pleased to train you in the area of special ism or expertise that you require as well as general training. We actively encourage all of our members to attend regular seminars and meetings, as an opportunity to not only build upon existing skills and relationships, but also for us to obtain feedback about how we can improve our services for you. We are very happy to spend time with our member toastmasters, offering advice and help about how to implement successful marketing techniques. Our member toastmasters are now finding that the marketing services that the English Toastmasters Association employ are working very well for many of them. 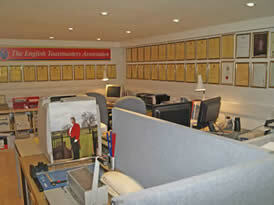 We are constantly promoting our sites, facilities and members and are getting some outstanding results for our members. New and existing member toastmasters are receiving enquiries from clients directly from their own page on the The English Toastmasters Association web site. 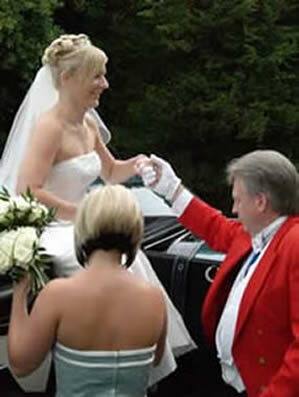 By using search engine registration and optimisation techniques, and sponsored links, we aim to give our professional toastmaster members better value for money membership and higher rankings on the Internet. Wherever your location The English Toastmasters Association welcomes candidates both male and female from any location worldwide. The training course takes place at the English Toastmasters Association Headquarters which is based in Danbury, Essex, England, UK. Upon joining the English Toastmasters Association, a full members page is also included for you within our web site and can be updated at any time incurring no additional cost to you. This page will help your marketing and publicity and may encourage future business. Many of the association's members have seen great success from their pages since joining. The duration of the course is 3 days, each of six hours, but this is a minimum, as the days often include meetings with other professionals in the hospitality and leisure business. A few more hours are beneficial. These meetings include getting together with other members, venue and catering management, photographers, videographers and offer discussions about the best methods of working alongside such professionals. The English Toastmasters Association training course is designed to suit you, dates, days and start times can all be agreed on an individual basis. Daily start times are usually between 8am - 10am with a view of finishing the day between 3pm - 5pm. Refreshments including lunch each day is included in the course cost as well as all onsite facilities including secure parking. We are pleased to recommend accommodation for the duration of your stay. Please feel free to contact The Association with any questions or queries you may have. We are on hand any time to offer support and help and are more than happy to offer further information and details about our training facilities and courses. Richard, Many thanks for a fantastic day with you, I have gained so much in a short space of time. Roy Austin Berkshire UK One day Alignment Course for experienced toastmaster joining the English Toastmasters Association. My sincere thanks for an excellent three days. My head is still buzzing and I am feeling enthusiastic and ready to go. The manner in which you have approached the course is relaxing and is conducted at a comfortable pace. I found the course interesting, informative and presented in a very personal manner. The one to one format is conducive to ensuring that Richard was able to see that each issue was understood before moving on to the next. Visits to venues and having lunch together also made the learning process more pleasurable. I do not believe that the course could have been presented any better and leave it enthusiastic and confident. Thank you Richard. As a member of the teaching profession for over 30 years I was very impressed by Richard's teaching style, which was both relaxed and thorough. At no time did he cast himself in the role of "expert", but, instead, he guided and mentored me through the course on equal terms, encouraging me to bring out and develop my own gifts and talents. At the same time, there was enough rigour during the training to ensure that all of the essential details were covered and that I felt equipped to further my career as a toastmaster. It was a privilege to be able to shadow Richard in action at a wedding and to be present at an actual meeting with clients. This provided much more insight into the realities of the job as toastmaster than any amount of classroom based theory could afford. I now feel that I am a member of the best professional organisation for toastmasters that there is, and that Richard is a senior "partner" in the full sense of the word.